When a minor political disagreement turns into an acrimonious battle of nerves, the stage is set for a senseless blame game. Beyond this point, the purpose is no longer to find a solution to the issue at hand. On the contrary, it becomes a matter of settling scores and, at best, winning. 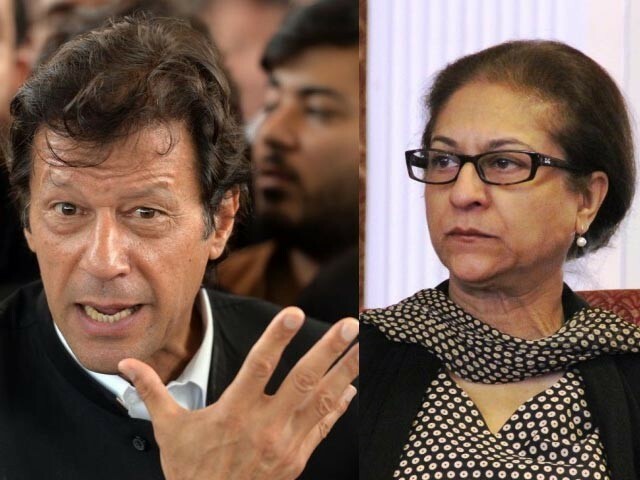 The war of words between PTI chief, Imran Khan, and prominent lawyer and former Supreme Court Bar Association (SCBA) president, Asma Jahangir, last week offers a glaring testament of this belief. Unfortunately, not all battles can be won through veiled assaults and criticism. The conflict brewed against the backdrop of former Chief Justice Tassaduq Hussain Jillani’s appointment as Chief Election Commissioner. Imran rejected this decision and issued statements against the judiciary. According to the PTI chief, ISI and MI officials should also be included in the judicial commission established to probe the allegations of rigging in the 2013 general elections. The legal fraternity was up in arms over his demands. However, this did not stop Imran from blowing the matter out of proportion. Addressing his supporters at the Islamabad sit-ins, he launched a scathing attack on Asma Jahangir for allegedly criticising the women who ‘dance’ at his protest. With his voice tinged with sarcasm, Imran attributed her new-found narrow mindedness to a new friendship with JUI-F chief, Maulana Fazlur Rehman. The PTI chief may have used political rhetoric to his advantage but his remarks came across as underhanded jibes. Trapped beneath the surface of sarcasm and veiled assaults, the root of the problem remained largely ignored. As a result, his remarks against the former SCBA president did not represent the problem in a clear and effective manner, and sounded more like an angry outburst. At a time when Imran has emerged as a bastion for democracy, there was no excuse for him to ignore the contributions of those who have struggled to rid the system of dictatorial tendencies. Asma Jahangir is an example of one such activist who has championed the cause with unflagging commitment. By launching his tirade, the PTI chief has systematically undermined her struggle for democracy. It would be easy to reject his remarks. After all, at a time when Imran was gracing the cricket pitch, Asma Jahangir was working to uplift the status of women. However, such a rejoinder would only reinforce the desire to announce a winner in this battle over unfulfilled demands. Meanwhile, Asma’s reaction to the PTI chief’s cutting remarks appeared to be justified. The former SCBA president has simply criticised Imran for his naïve behaviour and scornfully told him to go dance in India if he so desires. However, her responses deviated from the issue at hand and instead focused on irrelevant considerations. As with Imran’s reaction, the former SCBA president’s response is equally vague and problematic. The root of the matter lies with the appointment of the chief election commissioner. Imran did not provide a clear explanation on why he was against the former chief justice seizing the reins. According to speculations, the PTI raised doubt about Jillani’s appointment because the PML-N had thrown its weight on the nominee. Furthermore, others have pointed toward Imran’s tussle with various members of the legal fraternity as a possible reason for his objections. Although it is difficult to reach a firm conclusion on the matter, there are some things that cannot be compromised on. For instance, the PTI should remember that its sole purpose is to confirm rigging allegations in last year’s polls. If the party has a problem with the members of the judicial commission, it should voice its reservations with the legal fraternity and provide a reason for their dissent. Launching scathing attacks on each other will only add fuel to the fire. Over a week has passed since the conflict gained media attention. And yet, the crux of the matter seems to have been brushed under the carpet. At this critical juncture, both the PTI chief and Asma Jahangir should work towards clarifying their stance rather than taking a dig at each other over an unspoken dispute. A blogger on social events and has previously worked as Assistant Editor for a media magazine. He is currently pursuing Law Studies at the School of Oriental and African Studies. He tweets @TahaKehar. Will Chabahar Port reap greater benefits than Gwadar Port? Is battling women harassment a man’s duty as well? What about her remaining silent on the deaths of innocent people in the model town incident and government’s merciless shelling and firing on protesters in Islamabad? for the poor and the needy ?